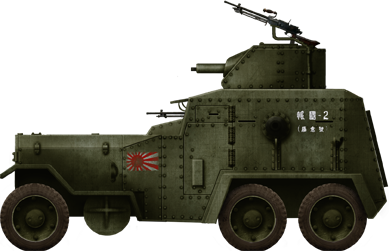 The Type 93 Kokusan was a navy armored car used in China. Little is known about this model, its production records are unknown, but it was built by the Ishikawajima Heavy industries at the Sumida Motor Car Factory in 1932. We do have a few photos and some specifications can be deduced from the chassis. It was apparently built on a 6×6 Ford truck chassis and well armed. 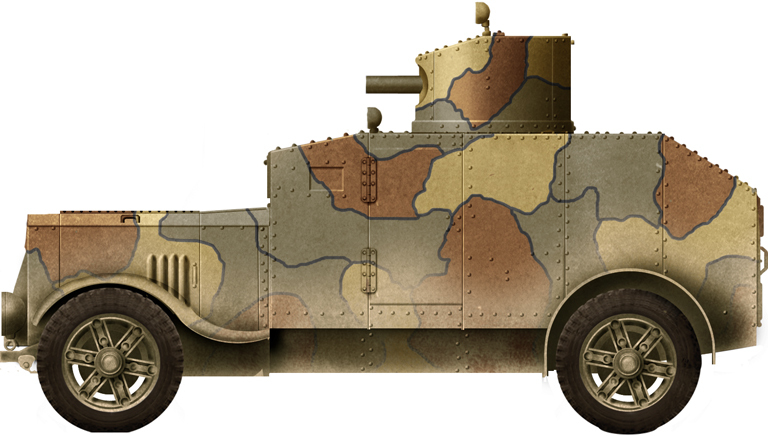 The Type 93 was basically an armored body wrapped around a Ford truck chassis. A framework held the bolted steel plates. 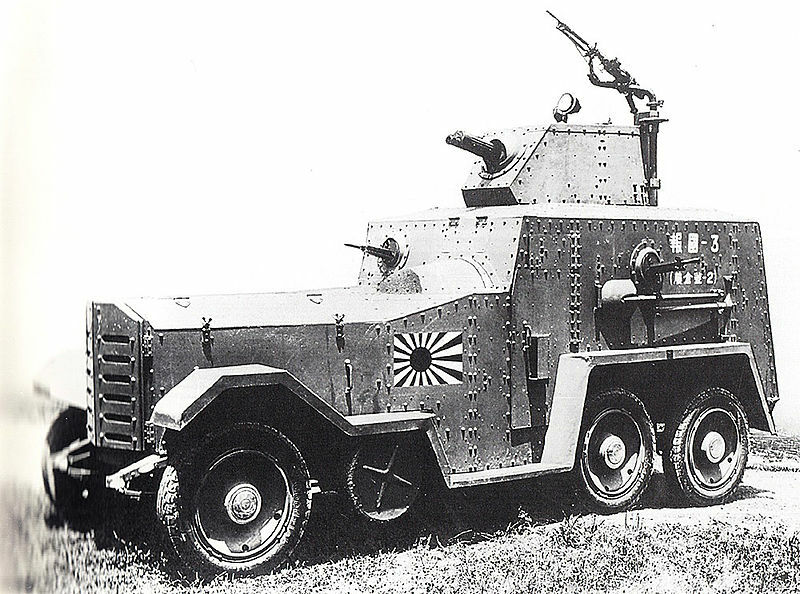 This armored car had limited off-road capabilities on softer grounds, as it was tailored for street fighting. The armor was flat for the sides, bottom, rear and front, and slightly sloped on the roof and engine hood. As usual, the turret was placed at the center-rear, cylindrical and partly sloped, with a 11 mm (0.43 in) frontal thickness. On the driver’s right there was a machine-gun mount, two other ball mounts were placed on the sides, while the turret mounted another machine gun, probably a Vickers 0.30 cal (7.7 mm). A pintle mount for an extra AA Type 91 machine gun was attached to the turret rear. Apparently, it had a pair of unditching metal wheels just after the front axle, which could be lowered to ease ground pressure and for enhanced crossings capabilities. Access to the vehicle was performed from the rear and sides. Hinged sight slit panels were mounted on the sides and front of the driver compartment. The crew counted the driver, commander and two gunners. 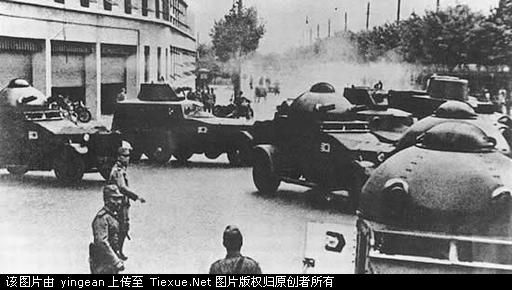 Records of this armored car in China are scarce. This model was was presumably modified to integrate lessons learnt in the 1932 Shanghai incident, and tailored for street combat in occupied villages and towns. 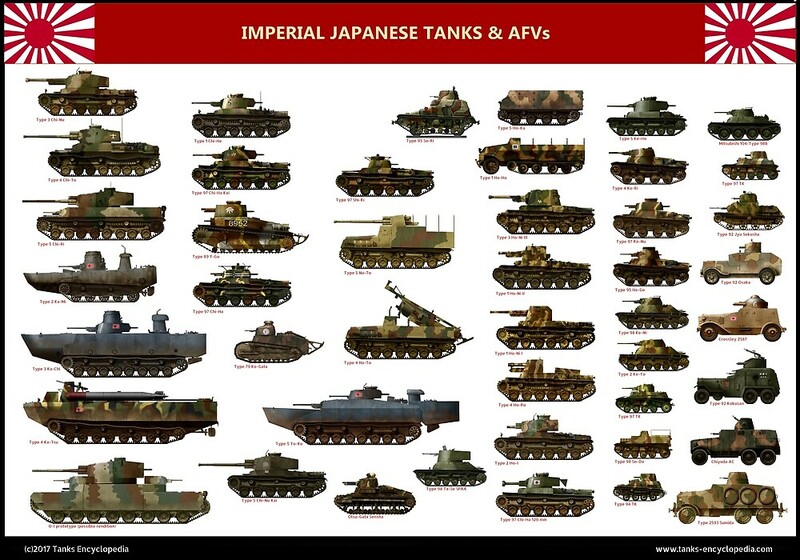 The 5 vehicles built (according to http://www.weaponsofwwii.com/) were all used by the Shanghai Special Naval Landing Force from 1933 on for security duties inside the European and the Japanese settlements in Shanghai. 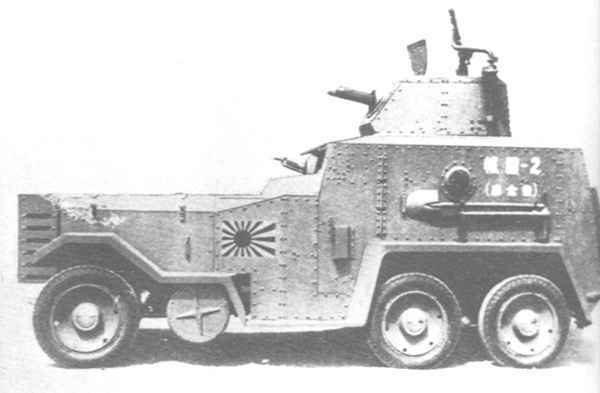 A Type 93 naval armored car in China, 1938. The small metal wheels behind the front wheels are not unditching wheels, and could not be lowered, rather, they prevent the car from bottoming out when it crosses obstacles. I believe it has a ~70hp inline 6 engine of some kind, but i cant be sure. Perhaps you could simply blur the markings in your model, as if the paintwork was imperfect?